Although I’ve periodically purchased items of A.P.C. clothing over the last couple of decades, I admit that it’s not a brand that I buy all that often. In recent years that’s largely been down to the distance between myself and the nearest A.P.C. store. But also because of the price. To be sure, I’ve always liked A.P.C.’s dependable esthetic and simple designs. 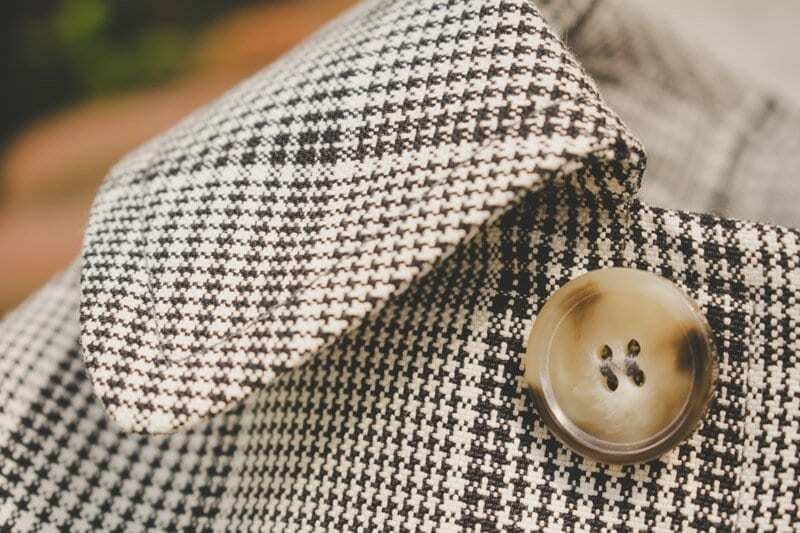 Equally appealing is the fact that, while never unfashionable, their clothes are rarely all that fashionable either – and so can be worn for a long time without becoming obsolete. It also goes without saying that if I’ve continued to buy A.P.C clothing, it’s because the brand has yet to disappoint in terms of quality. However, given the increasing trend for even long-established high-end brands to throw standards to the wind in the quest for ever greater profit margins, I was concerned that A.P.C. might also have sold out to the fast-fashion economic model since I last purchased anything from them. A fear further fanned by the brand’s noticeable retail expansion over the last few years. However, paranoid speculation regarding production standards wasn’t enough to stop me from falling in love with the Skipton Mac after first seeing it online. And my bank balance was duly sent to the wall. But were my gloomy prophecies of waning quality justified? Or is A.P.C. still keeping it real? Read on to find out whether the APC Skipton Mac is on a par with the brand’s earlier high-quality output. The Skipton Mac’s most unusual design feature is undoubtedly its rather strange hybrid sleeve and shoulder construction: a regular set-in seam at the front and along the ridge of the shoulder, but a raglan design at the back. I’m assuming this serves no practical purpose other than satisfying the designer’s sartorial perversions. But who knows, perhaps there is a more legitimate structural reason for doing this after all? As unconventional (or unnecessary) as this feature might be though, it by no means compromises the coat’s esthetic appeal. Indeed, some may like the quirkiness. In any case, it will likely pass unnoticed by anyone but the most nitpicking of clothing connoisseurs: camouflaged as it is by the coat’s dominant glen plaid cloth. This curiosity aside, the Skipton is fairly classic and minimal, and there’s not a great deal to add about its design that can’t be clearly understood from the accompanying photographs. Suffice to say, as macs go, it’s really quite an elegant and conservative affair. Or at least it would be conservative if it weren’t for the slightly eccentric fabric: a weave that I’m aware treads a dangerously fine line between trad country gent, and attention-seeking peacock. Labelled as “faux black,” it’s actually quite difficult to see what could be considered “false” about the color. Indeed, “fake green” or “fake beige” would be more accurate: seen from a distance the coat more often looks to be one of these two shades. On closer inspection though, it is in fact a prince of wales check in a slightly off-white and a very real shade of black. And not a hint of green or beige in sight. Made of quite thick 75% cotton and 25% virgin wool fabric, the Skipton Mac is a little heavier and stiffer than I’d anticipated when I first saw it. It probably hangs all the better for the weight, and the rigidness isn’t a problem, it’s just not quite the loose and sleazy mac I was expecting. No loss in the end though, as I already have several scruffy Columbo-style numbers in the closet as it is. The flipside to this extra weight of course is that the Skipton keeps the wearer nice and warm. 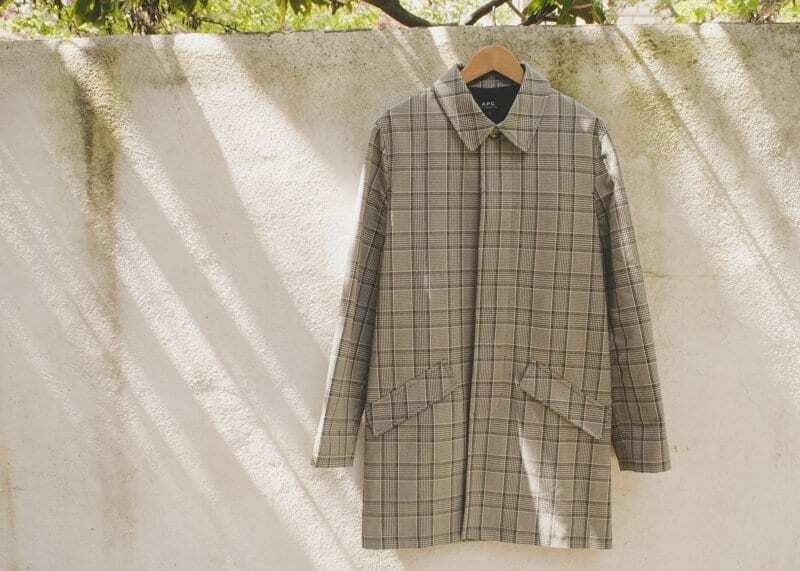 Sure, it won’t see anyone through an East Coast winter, but it’s the perfect transition-season coat, and a great year-round item for somewhere like the Bay Area. seams – which are presumably intended to make the garment that little bit more resistant to all the stress inflicted by a wearer’s body. As the designer behind a brand that is so often labelled “minimal,” A.P.C. founder Jean Touitou is very much aware that the success of his business depends on producing great fitting clothes. After all, without the distraction of gimmicky and modish designs, all that’s really left is cut and fabric. Since A.P.C.’s inception 30 years ago, the market for the label’s clothing has become increasingly global. For a designer so focused on achieving the perfect fit, this presents something of a challenge: Touitou now needs to make clothes to suit a diverse range of body types, from Asia to America, Scandinavia to Africa. Admitting that there’s no truly satisfactory solution to this problem, Touitou says that sometimes “cruel choices” must be made. Which only leaves me wondering what “cruel choices” were behind the decision to make the sleeves of my Skipton Mac so damn long? To fully appreciate the significance of this comment, you need to understand that it comes from someone whose evolutionary distance from our simian brethren is evidently much closer than conventional biological science is willing to admit. I.e. my arms are sufficiently gangly that they would not cause undue embarrassment if they were instead attached to the body of a gorilla. If the Skipton Mac’s sleeves are too long for my arms, anyone less well endowed in this department will be lucky to see the tips of their fingers peaking out the ends! Of course, this phenomenon could easily be explained if the coat were too big for me overall. Quite the contrary, I have the Skipton in a size XS, and it is actually a little on the tight side. Indeed a size S would probably have worked better if I ever wanted to wear it with a suit, as even with just a light sweater underneath the XS fits me very snugly on the shoulders. And it’s worth noting that my prodigious limbs are sadly not matched by equally broad shoulders. Tight on the shoulders and long in the arms? The Skipton Mac is clearly made for people with the physique of a broomhandle. That’s the bad news (unless you’re a broomhandle). But looking on the bright side of things, the Skipton’s sleeve-ends are of such a simple design (no buttonholes, fastenings, straps, cuffs or any other details) that this problem was barely any more complicated for my tailor to fix than taking up the hem on a pair of pants. Perhaps this is a deliberate A.P.C. “cruel choice” solution to the demands of a diverse global marketplace: design sleeves and other important parts of the garment as simply as possible so that wearers can easily have them altered to fit. What next, unstitched seams and loose buttons that buyers are expected to attach themselves? It might just catch on! The Skipton Mac has nice deep front-pockets with stylish flaps. So far so good. The problem for me is inside: while there is an inner pocket, and it is large enough to take keys, smartphone or a wallet, there’s no way of fastening it so that these items won’t be at risk of falling out. This is a personal thing, I know, and certainly not a problem that’s unique to the Skipton Mac, or even to A.P.C. for that matter. But I really wish that all coats would come with a securely buttoning or zippered inside pocket. No excuses. I hate stuffing the pockets of pants or suit jackets with clutter. Yet I also want my things close to hand, and not be forced to carry a bag around all the time. More seriously still, I want somewhere secure to put small valuables when I travel. Anyone who spends any amount of time in airports likely has their customs and immigration routine down pretty tight: watch and rings pulled off as you approach the entrance to the Departures area; pant pockets emptied while you stand in line; laptop pulled out of your bag before you get to the x-ray machine. All these small items need to be kept together somewhere safe. As my coat goes through the x-ray, I don’t want wallet, coins, jewelry, tickets and other valuable belongings unceremoniously spilling out into the plastic tray. Or, worse still, directly onto the conveyor belt. A generously proportioned and tightly-closing inside pocket resolves this problem. And many others beside. Surely I’m not the only one who considers securable interior coat pockets a basic essential? Designers, what does a 4″ zipper cost? This minor shortcoming and the unusually long sleeves aside, it seems that A.P.C. still produce understatedly stylish and well-made clothing. It is no doubt these qualities that have garnered the brand such a cult following in Japan, one of the last remaining nations to still appreciate high quality goods. Although it might be a few more years before I next buy another A.P.C. item, I’d be surprised if the Skipton Mac is the last to find its way into my closet. Zippered interior pockets or otherwise.